Early Booking Offer – Book early and save up to 35% off the room rate. Please contact us for further details. 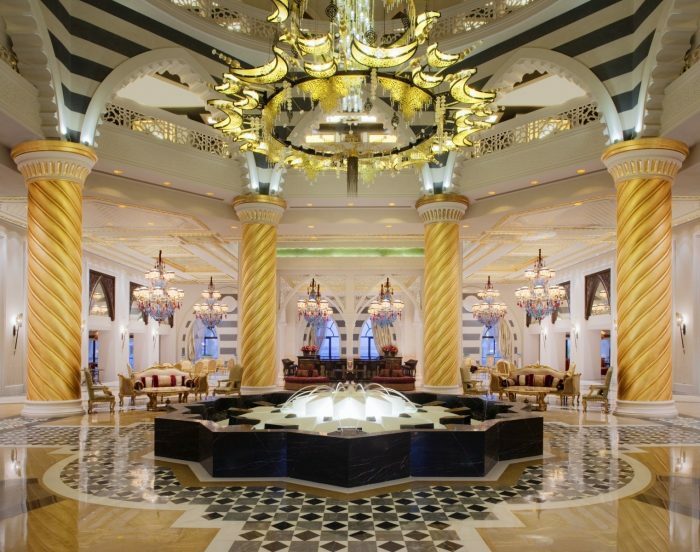 Jumeirah Zabeel Saray, Dubai is a monumental beachside resort on the Palm. Based on the Ottoman era, every indulgence is graceful and elegant. Discerning guests are showered with breathtaking hand painted ceiling and murals, crystal chandeliers shining so bright that they light up any decadent space and an art gallery that is exhilarating. Guestrooms are timelessly elegant, offering breathtaking ocean views. Rich in Ottoman style, the opulence in each guestroom is staggering and evokes emotion. Regal and palatial, guestrooms are rich in colour and texture and are fit for a king with marble baths and rain showers. Marvel at the resorts beauty from the private balcony and be amazed by the inspiring views. Tropical gardens surround the property and guests are deserted on the private soft beach offering incredible views of the crystal clear waters of the Arabian Gulf. Whether on Jumeirah’s private jetty or banana boat, experiences in the Arabian Gulf are to be enjoyed. Relaxing by the infinity pool, playing a game of tennis or soaking in the Jacuzzi are just some of the time passes available at Jumeirah Zabeel Saray. Upgrade Offer – Complimentary upgrade to Half Board available on applicable stays. Early Booking Offer – Book early and save up to 35% off the room rate. Showered in ultimate tranquillity and extravagance, the Talise Ottoman Spa is focussed on a well being journey for each discerning guest. Set in lush tropical gardens, this hideaway is awe inspiring. The Couples retreat, spa and hammam’s are moments of supreme excellence focussing on a serene and restful sanctuary. Including three Turkish hammams, eight saunas, three steam rooms, two snow rooms, eight spa pavilions, three relaxation lounges and two Thalassotherapy heated swimming pools, guests are glamorised and reenergised, in privacy. Sinbad’s Kids Club – A kids club like no other, younger Jumeirah guests are kept entertained with art and crafts, rock climbing, soft play and watching films. Pool – The infinity pool is beautifully laced with sun loungers and the perfect amount of shade. Step into the Jumeirah Zabeel Saray for your honeymoon are be astounded by the exhilarating beauty. Relishing in Emirati elegance is a fanatical experience for all honeymooners and guests are subjected to one beautiful picturesque moment to another; encapsulating views of the Palm, The Gulf and the incredible sophistication of the Ottoman styled palatial hotel. Rich in culture and authenticity, guestrooms have been created using intricate carpentry, lavish interiors, textures and fabrics and buoyant in colour. Alluring serenity is afforded in each guestroom and watching the sun set past the Dubai Skyline whilst sat at your private balcony is an unforgettable moment. Enjoy tempting cuisine that will make your heart flutter with taste and presentation and finely chosen wine complimenting every mouthful. You can also dine amorously in the privacy of your guestroom. Many water sports activities are offered, making sure that you and your loved one are kept thoroughly entertained with moments that will forever remain with you. Whether regional local cuisine or international delicious dishes, each eatery will be a pleasant time. Lalezar – Classic Turkish cuisine is served; delicious meats and flavourful sauces. Voda Bar – The resident DJ plays upbeat music for guests to mingle their night away. Beverages flow, music strums and sushi to be snacked on. Music Hall – Cabaret and cultural entertainment is presented at the Music Hall. Entertaining, live music from around the globe, with ten live acts every night.